It is hard to imagine that YouTube is only five years old (as of Sunday) but it is. I wanted to share with you a neat new search feature that YouTube seems to be playing with, a form of tag search. 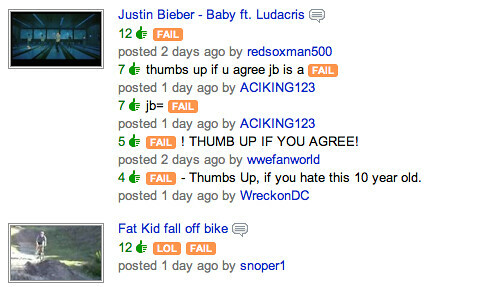 As you can see, it searches the comments on YouTube videos for the hashtag fail (i.e. #fail). Supposedly only a handful of hash tags actually are searchable now, including #FAIL, #OMG, #LOL, #FTW. Meanwhile, there is a bug on YouTube comments that prevents some comments from being deleted. Finally, I produce a weekly video that I publish on YouTube as well as other places like iTunes and on this blog. If you love search and YouTube, you can subscribe to my YouTube Channel over here. Forum discussion at WebmasterWorld, Google Blogoscoped & YouTube Help.